GAPING moonstruck at Lionel Messi, a poet cut from divine cloth, it is possible to experience a blood-pulsing capstone of joy and yet, nonetheless, be caught in a terrible chokehold of sorrow. And to curse the inexorable emptying of the athletic life’s hour-glass, to understand Shakespeare when he mourns how the passage of time will “dig deep trenches in thy beauty’s field”. Messi, an act so brilliantly far-fetched as to be beyond the imaginings of Barnum and Bailey, a one man insurgency against the limits of grace and refinement, turns 32 this summer. The clock, that pitiless instrument of death, the thief who can never be foiled, is ticking. Messi, a man of few words yet beyond compare as an orator of life-affirming sporting lyricism, the Cicero of the coliseum, will, relatively shortly, deliver his final State of the Union address. It is chloroform to the lungs for all of us who have who have known the special joy of watching him, for 15 years now, seize and reshape moment after thrilling moment. When Messi steps on to the altar, there is rarely a single atheist in the cathedral. In 20 years’ time, those who will fill Old Trafford on Wednesday will feel their heart beat faster remembering how they couldn’t look away when the Catalan sorcerer went to work. Even the most embedded Manchester partisan could not deny that the rhythm of Messi’s work has a Mozartian air. And, though it might sting them to the marrow, the suspicion is that the Stretford End, as they did so magnificently for the Brazilian Ronaldo 16 years ago, would rise as one should the Argentine artist add to his collage of genius this week. Because you cannot properly love sport and fail to be seduced by the quicksilver feet of the Prince of the Pampas. In three decades in the newspaper toy department, I have been blessed to have a front row to watch one great name after another bend the course of sporting history. Yet, even in that ecosystem of high achievement, three stood apart. Michael Jordan, Tiger Woods and Messi elevated their chosen code to the territory of witchcraft. Swimming through the air in full His Airness majesty, immune to gravity, refusing to lose, Jordan made his audience shriek as though they had trod on the third rail. Peak-era Woods not only shared Jordan’s contempt for anything other than the highest rung of the ladder, he had the nerve, at Augusta and Pebble Beach and St Andrews, to keep delivering colossal moments. As with Jordan and Woods, Messi amazes so often that you almost feel cheated if, on any given night, he fails to amaze. He might be the product of some fevered imagination: Dancing on quicksand, the fantasy island of his mind conjuring pictures beyond the bandwidths of mortal vision. For those who measure greatness in numbers, there is an abundance of eye-watering, skyscraping statistics. Like 659 goals in 805 appearances for club and country; 91 goals in a single calendar year (2012); five Ballon D’Ors; 51-hat-tricks; 111 Champions League goals. Yet if the figures are supernova, still they reveal only the tiniest inanimate fragment of the essence of Messi. Barca’s old master allows us to dream with our eyes wide open. He is Vitamin D for the soul, a sunburst of joy, a powerful, cleansing, high-art, spirit-raising uplift. He makes people happy. With choreography beyond the speed of thought, an ability to slice through wormholes of space, and an unrivalled arsenal of murderous feints, he has ferried the devotees of the Camp Nou to some miraculous sanctuary of high achievement. Messi is an enchanter, occupant of some dreamy alcazar where euphoric possibility forever flutters on the air. He inhabits a plateau so high up in the stratosphere that just watching him can induce a kind of giddy vertigo. Perhaps there is a fatalism in believing that this grand opera is approaching its final act. After all, his stupefying free-kick that triggered Barca’s injury time recovery from a 4-2 deficit against Villareal on Wednesday last was his 42nd goal in 39 games this season. As a crude means of comparison, Marcus Rashford, Anthony Martial, Alexis Sanchez and Jesse Lingard have scored a combined 32 times in all competitions in 2018/19. 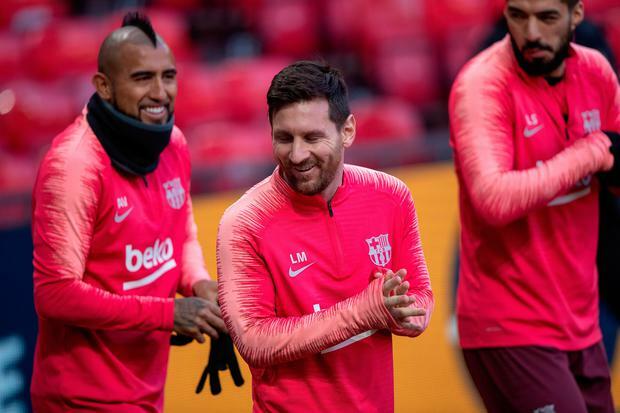 Going into last Saturday's meeting with Athletico Madrid, with Barca looking to drive a stake through the hearts of their nearest La Liga rivals, he had scored 12 times in his most recent nine games. Inevitably, he delivered the decisive sword-thrust in a 2-0 victory that assures another league medal to add to his collection. Perhaps his palette of skills will continue to paint masterpieces for many years, maybe he can remain a brand ambassador for the beautiful game long into the 2020s. Yet even a winner in the genetic lottery cannot outrun time. Even a stopper of all the clocks cannot stop all the clocks. So, even those who bleed Manchester red, who remember how he broke United in the Champions League finals of 2009 and 2011, might want to pause for a moment on Wednesday. To celebrate an athlete running an entirely different race, to mark a career that has been a love song to transcendence. And to imagine the empty space, a vacuum too vast to ever remotely fill, when, for the final time, the little sculptor of immortal moments departs the sunlit stage.